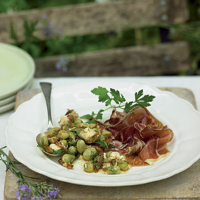 Andalucian cuisine uses broad beans a lot, so it's no surprise that the smokiness of Spanish ham and the full-bodied flavour of sherry vinegar partner them well in this salad. Eat with plenty of crusty bread. Heat 2 tbsp oil in a frying pan and sauté the onions and garlic for 10 minutes over a low heat, covered with a lid, until soft. Add the sherry vinegar, broad beans and 100ml water and bring to the boil. Cook for 5 minutes with the lid on, then for a further 2 minutes uncovered until the water has almost all evaporated and the beans are tender. Tip onto a large platter and crumble over the goat's cheese; serve with the ham and scatter over the parsley.